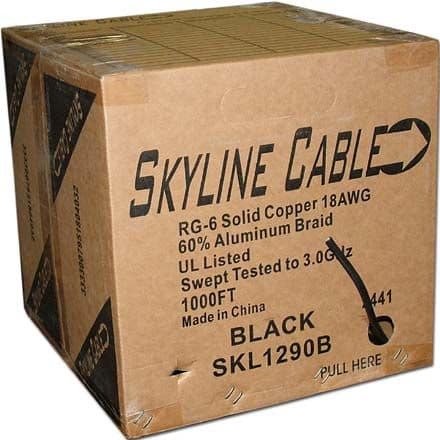 Our Skyline™ coaxial cables provide both versatility and the best quality. This Copper Clad Steel cable gives you durability and cost-efficiency, which is great for your installs and your budget. 1000ft of this professional grade RG6 Coaxial Cable is included in a long-lasting and dependable box. Dependability in a Box: Our bulk wire boxes stand tall as they have the strength and durability to withstand multiple installs. This brute of a box will handle any harm that comes its way! Made to perform for a lifetime, rest assured knowing your wires are always protected. Unrivaled Clarity: This coax cable has a 99.9997% oxygen free copper conductor that ensures signal integrity. Effortless Install: Our Skyline™ cable has easily-strippable jackets and sequential distance markings making your install effortless. 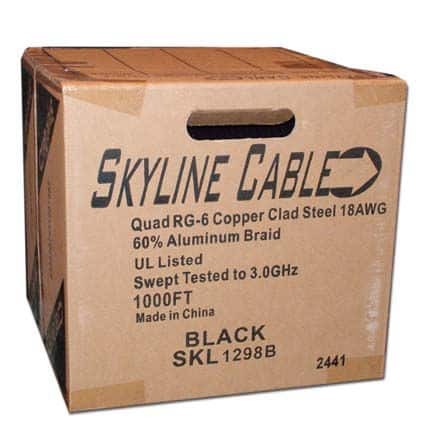 Skyline CCS RG-6 single coax, with 17awg messenger wire attached, black, 1000ft reel-in-box. 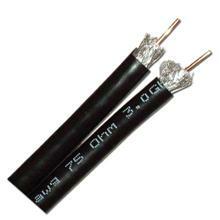 This RG-6 coaxial cable is swept to 3.0 GHz. It has 60% aluminum braid and 100% aluminum foil. 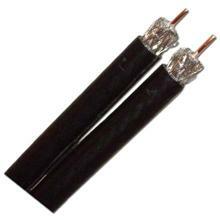 The center conductor is 18awg copper clad steel. UV inhibitor jacket. Its about time you have a coax cable that will allow you to easily make custom length video/audio cable. 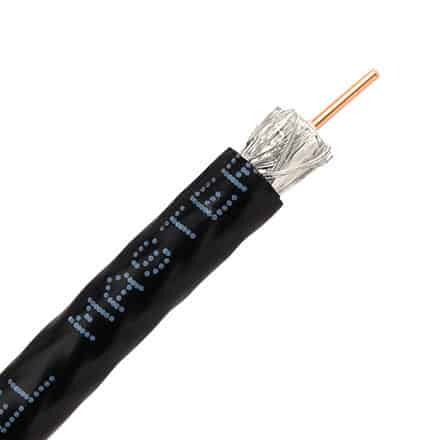 This versatile Coaxial Cable from Channel Master is both Dish Approved and UL listed. 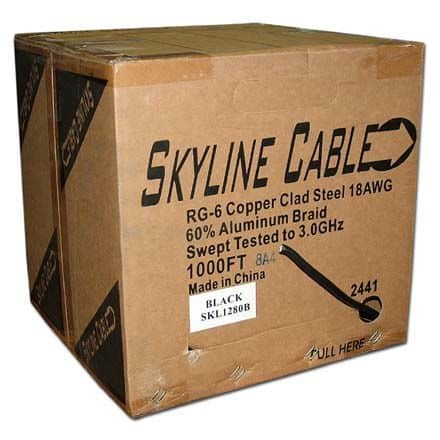 1000ft of this professional grade RG-6 Coaxial Cable is included in a long-lasting and dependable box. 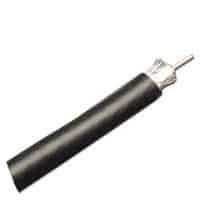 Center Conductor The center conductor is solid copper-clad steel wire for maximum signal transfer at RF frequencies and excellent strength during installation. The copper is metallurgically bonded to the steel per the requirements of ASTM B 566, Class 10 A. 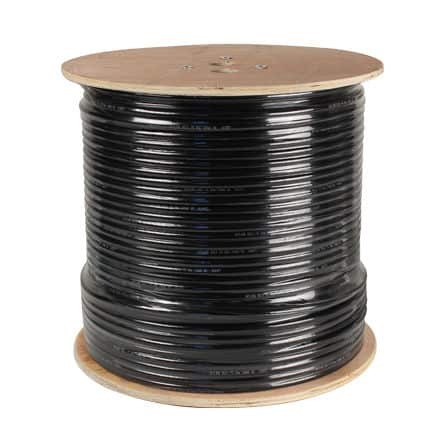 In addition, a proprietary, specially designed adhesive is applied as a coating to the outer surface of the center conductor to keep moisture from the interior of the cable and to sustain overall cable mechanical integrity. Braid Layers Channel Master coax is constructed with four layers of braid. Alternating layers of base shield-tape and aluminum wire enhance the shielding required in harsh environments and provide the highest level of protection from signal ingress and egress. PVC Jacket High quality jacketing is used to protect the cable both from the rigors of installation and the environment. This jacketing can also be easily stripped to help make your install both fast and easy. 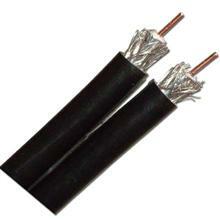 Resilient Design Whats more, Channel Master coax is 100% sweep tested, and is also flame retardant and UV resistant. Its about time you have a coax cable that will allow you to easily make custom length video/audio cable. This versatile Coaxial Cable from Channel Master is both Dish Approved and UL listed. 500ft of this professional grade RG6 Coaxial Cable is included in a long-lasting and dependable box. Dependability in a Box: Heres a box that has become a real fan favorite. They stand tall with the strength and durability to withstand multiple installs. 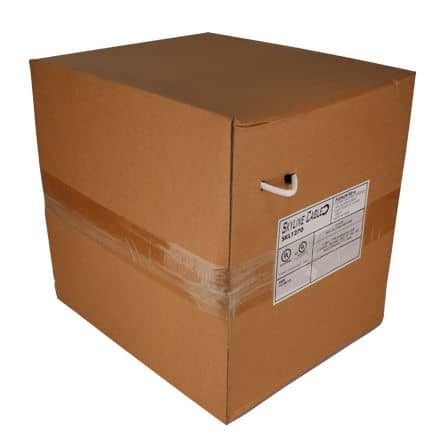 This brute of a box will handle any harm that comes its way! Made to perform for a lifetime, rest assured knowing your wires are always protected. 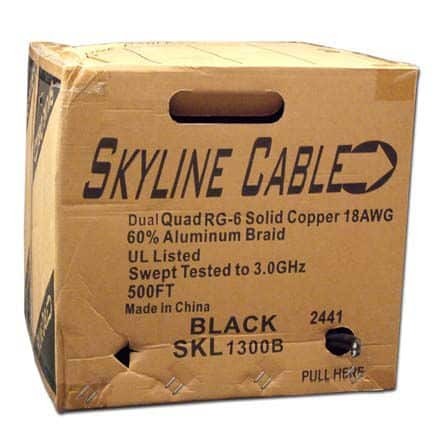 Skyline CCS RG-6 Quad coax, black, 1000ft reel-in-box. 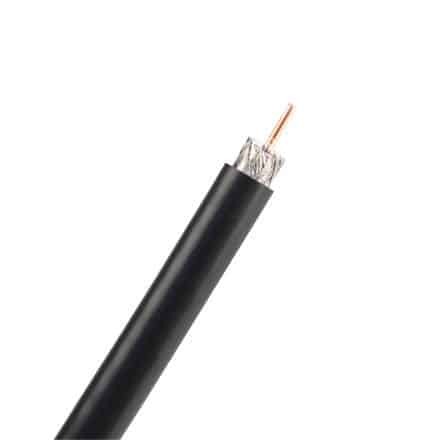 This RG-6 Quad coaxial cable is swept to 3.0 GHz. It has 60% aluminum braid and 100% aluminum foil. 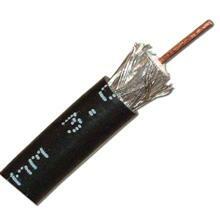 The center conductor is 18awg copper clad steel. UV inhibitor jacket. 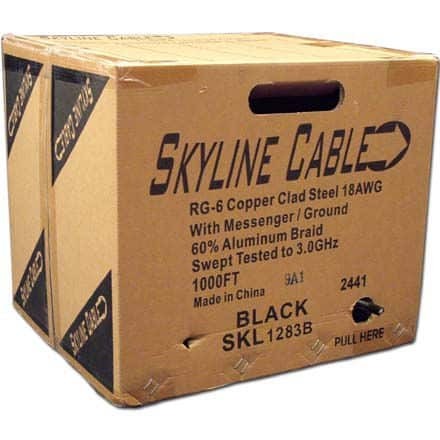 Our Skyline™ coaxial cables provide both versatility and top-notch quality. This Solid Copper cable gives you high conductivity and flexibility, allowing you to have longer cable runs and an easy install. 1000ft of this professional grade RG6 Coaxial Cable is included in a long-lasting and dependable box. 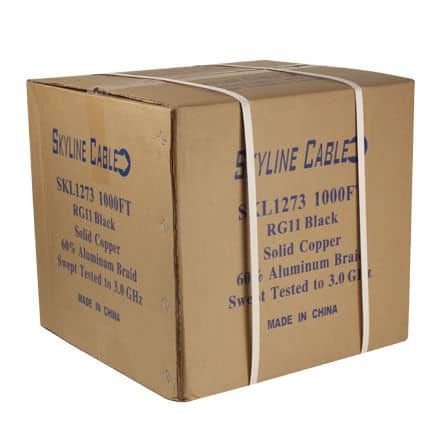 Our Skyline™ coaxial cables provide both versatility and the best quality. This Solid Copper cable gives you high conductivity and flexibility, allowing you to have longer cable runs and an easy install. 1000ft of this professional grade RG6 Coaxial Cable is included in a long-lasting and dependable box. 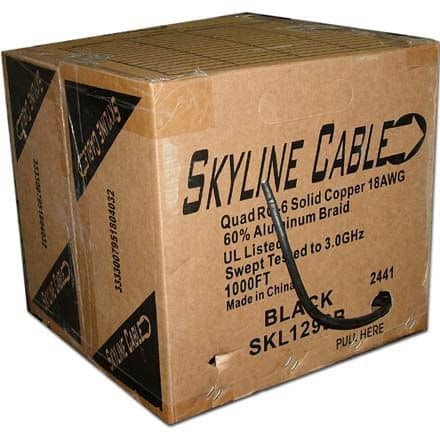 Skyline Solid Copper RG-6 Quad coax, black, 1000ft reel-in-box. 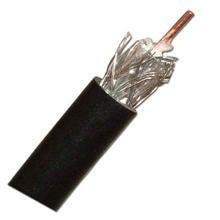 This RG-6 coaxial cable is swept to 3.0 GHz. It has 60% aluminum braid/40% aluminum braid and 100% aluminum foil. 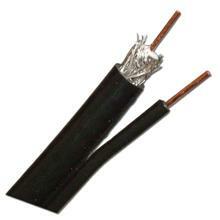 The center conductor is 18awg solid copper. UV inhibitor jacket. UL and CL2 approved. Plenum a Plenty! 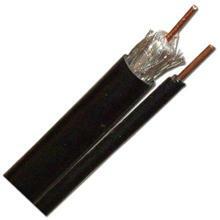 : This plenum coax cable will ensure that your installs are up to code and will pass inspection. The fire retardant jacket is safe to run every time! Unrivaled Clarity: Our copper cables have a 99.9997% oxygen free copper conductor that ensures signal integrity. BIG installs call for BIG cables. We know you come across those projects that require a sizeable cable run that wont skimp out on signal integrity. Thats why were one of the few that offer an RG-11 Coaxial Cable for those really BIG cable runs. 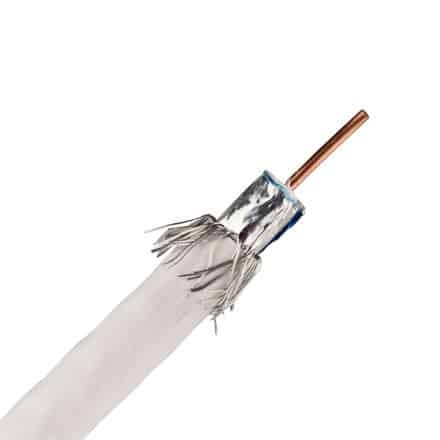 Our RG-11 coax cables have a bare copper center and can operate on frequencies as high as 3GHz, thus ensuring high quality signals over the longest distances. One Tough Cable: This coax cable is thick, tough, and durable, meaning it can withstand just about any abuse. Its your perfect solution for those really long cable installs. Reel Strength: Our wooden reels are both thick and heavy-duty. Its solid wood construction allows for a quick and secure install. Effortless Install: This Skyline™ cable has easily-strippable jackets and sequential distance markings making your install effortless. Operating Temp. Range: -20 to +75?